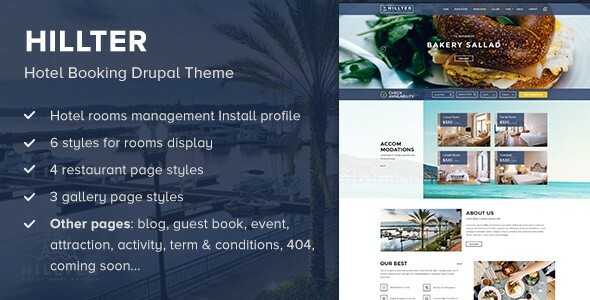 Hillter is an attractive and modern Drupal theme that is perfect for hotels, resorts, villas, B&B’s or any types of hotel industry website. It comes with an eye-catching header with its multiple built-in slider at the banner. The theme also provides a pleasant user experience and increasing bookings with an advanced booking form featured on the home page. And let our gallery help you to exhibit your beautiful and amazing Hotel’s shootings and video that words won’t even do it justice. Beyond the outstanding looking, the theme features an advanced theme settings and highly customizable settings, which help you to configure and modify the site in your own way. Other pages: blog, guest book, event, attraction, activity, term & conditions, 404, coming soon. Item Reviewed: Hillter Hotel Booking Drupal Theme 9 out of 10 based on 10 ratings. 9 user reviews.